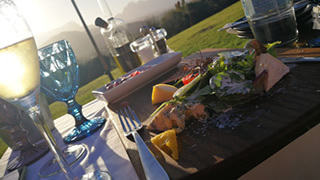 Roca Restaurant is located on the Dieu Donne Wine Estate on the lower slopes of the Franschhoek Mountains with breath-taking views of the Franschhoek Village below. It just seems meant to be that the location of Roca on Dieu Donne Wine Estate is actually translated as “Rock on God Given Land”. This becomes apparent on first observing the iconic views of the Franschhoek Valley from the upper deck of the double volume Roca Restaurant. Roca Restaurant serves up delicious and exciting tastes of the Mediterranean. Our emphasis is on the fresh and highest quality local ingredients with respectful, simple treatment of food. The food will be more than reason to come back to Roca, but when adding an extensive wine list as well as mind-blowing cocktail menu, you soon realise why it is so difficult to get a reservation at Roca Restaurant. Add to this the breath-taking views of the Franschhoek Valley below and you will see how guests can spend hours lazing in the sun sipping cocktails on weekends. Roca Restaurant is one of the most popular restaurants in Franschhoek and you have to book your table in advance - especially between the months of September to April when we are at our busiest. Roca is also a very popular wedding and functions venue.